Walking across the vibrating bridge, I could feel the heartthrob of the city. 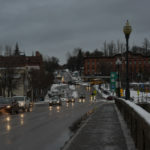 Early morning traffic rushed through a fresh wintery mix as the mighty Winooski River rumbled below. I was darn careful not to slip. In art and in life, rewards are rare without risk. My Grandparents used to own the apartment block that was just before this bridge on the left in front of the old mill. Spent many days as a child there being warned not to go near that river! And if you go on the River Rd. to the right in this picture, that is where we used to go get cruller donuts. A very familiar picture! Thank you for capturing it! Thanks Marion, cruller donuts sound wonderful. Good memories! I’ve been enjoying the more “gritty” aspects of winter via color lately for some reason. I don’t question it too much, just follow my heart. Thanks Sharon! Peter, Once again you have captured it. Viewing this scene for the past 25 years I can truly see it in your painting. Well Done sir. Another home run, Peter. It seems your last 3 or 4 posted paintings have had a common design element of dramatically receding perspective lines pulling us in to the composition. Beautifully done. Love the amber glow and reflections. Thanks Steve! Yes, my paintings seem to string together from one to the next with common themes, colors, and/or approaches, gently evolving over time. If we can manage to bring a bit of what we learn in one painting to the next and beyond, gradual improvement is the thankful result. This pictures brings back many memories. While attending Champlain College I met my future husband who going to St. Mike’s. We walked back and forth over this bridge many times and stopped for coffee just around the corner. Love this! Sister lives right in the area! Somber skies and muted blues and grays seem to echo the smoke from furnaces and rumble of gears from yesteryear’s mill, and the powerful voice of the river. 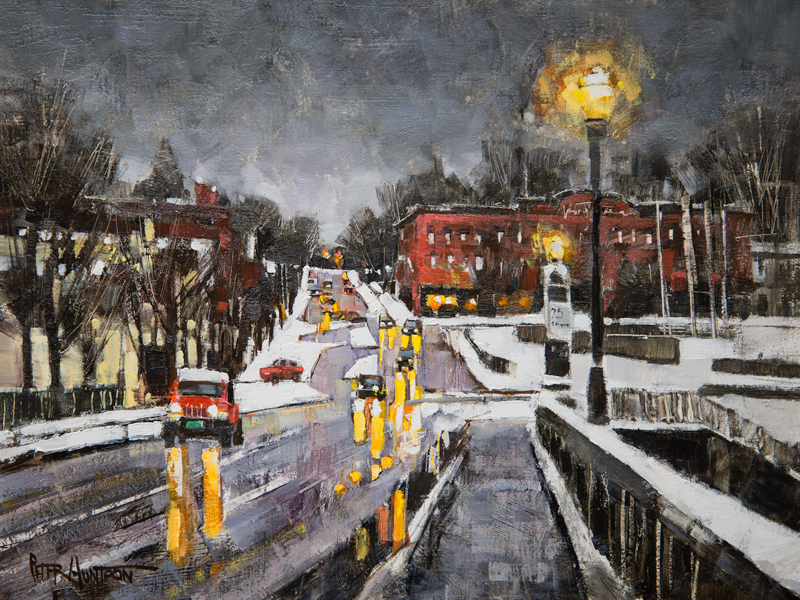 In turn, glowing headlights and lampposts speak eloquently with warm color and light, of the vibrant spirit and warmth of Winooski’s residents, both past and now. Eloquent as aways Brian, thanks! Definitely and historical, industrial vibe here, and it couldn’t help but spill into the painting. 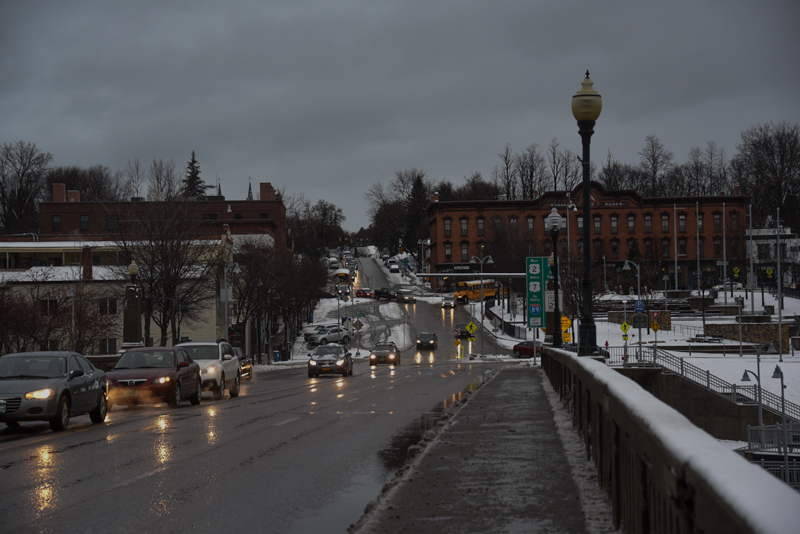 this does bring back some childhood memories, my very french grandfather used to live in the “old Winooski Block” you have so wonderfully pictured. I remember as a child the inside hallways to the bathroom being so dark and kind of scary, but Pepere’s place with the high ceilings and long windows was always bright! Thanks Theresa, the old buildings have such character. When I saw this picture my heart jumped and I felt a jolt. Many years ago, in 1980 my husband no I lived in Vermont where our first son was born. My husband attended medical school at Univ of Vermont and we were dirt poor. Since we had 2 big dogs we loved, we had little choice places to rent. We ended up in Winooski, at 219 Mallets Bay Ave in a rundown place we could only heat to 55 degrees max. We and our baby slept with our dogs to stay warm. No car so I walked , ran and biked everywhere with my baby. All over Winooski and to Burlington. We loved it there. Nothing was a hardship, we were happy, happy ,happy! I would love to visit there, and was so grateful to visit via your picture. Thank you for reviving happy memories. Hi Susan, I like your familiar story. So it is in the early times of family life. And a painting like Peter’s painting brings back the moods and the emotions. For me as a German it brings sympathy for the state of Vermont and the friendly people living there. I hope we are able to guard this nice relationship between the fans of Peter’s art in this special way. Every week we see another side of Vermont and I’m always curios to see the new painting an to read the comments. Do you agree?? My Trinity College classmates (very early ’60s) and I would trudge down the hill to our beloved watering hole The Mill, where Julie would greet us. Friday night’s would be either Bove’s Restaurant, down and up Burlington’s steep Pearl Street, or down and up the steep Colchester Avenue to The Mill. No wonder we were all in super physical shape. Peter, have you done any paintings of those two places? Thanks for the jolt of wonderful memories. Thank you Linda, I have not done those, at least not yet. I have a very long list of possibilities, but alas, art is long and life short. Good memories! I just discovered your paintings . My parents still live in Barre and at one time i worked in a salon in that brick building in winookski . It was called “Waves”. Loving e dry painting I’ve seen so far !!!! Thank you !